Heat oven to 400°F. Lightly spray cookie sheet with cooking spray. In 10-inch skillet, cook sausage over medium-high heat 6 minutes, stirring frequently, until no longer pink. Remove sausage to bowl. In same skillet, heat oil over medium-high heat. Cook bell pepper and mushrooms in oil 5 minutes, stirring frequently, until tender. Add vegetables to sausage. Stir in olives, oregano, basil and red pepper flakes. Unroll dough on cookie sheet. Starting at center, press dough to 14x10-inch rectangle; cut into 4 (7x5-inch) rectangles. Spoon 1 slightly heaping tablespoon pizza sauce onto each rectangle to within 1/2 inch of edge. Top half of each rectangle with sausage mixture and cheese, spreading to within 1/2 inch of edge. Fold dough in half over filling; press edges firmly with fork to seal. Brush with egg. Bake 20 to 25 minutes or until golden brown. 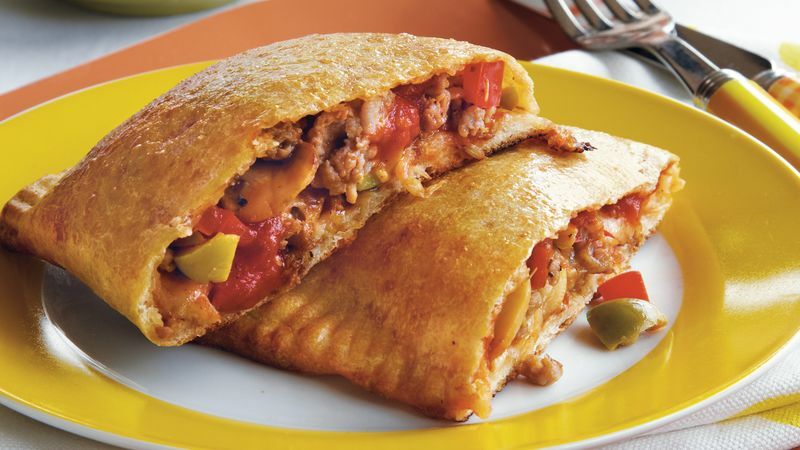 Serve warm calzones with warm pizza sauce for dipping. For best results, dip fork in flour before crimping edges of each filled calzone.